Microcrystalline cellulose, vegetable stearic acid, croscarmellose sodium, magnesium stearate, silicon dioxide. Accidental overdose of iron-containing products is a leading cause of fatal poisoning in children under 6. Keep this product out of reach of children. In case of accidental overdose, call doctor or poison control center immediately. 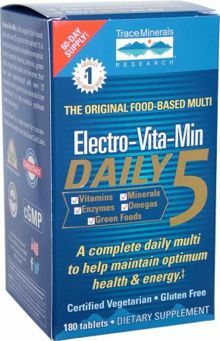 1-6 tablets per day divided with meals. Take 6 tablets for optimum benefits. Electro-Vita-Min. A complete daily supplement that combines the benefits of multiple vitamins with the advantages of ionic minerals and trace minerals.